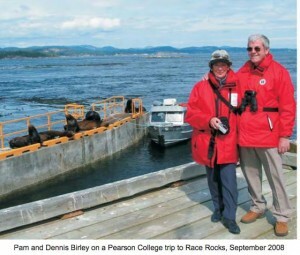 In an e-mail I received in 2004, Pam Birley told me she was a grandmother living in Leicestershire England, and that she used the remote cameras on the www.racerocks.com website to help her grandchildren learn about the environment. She included screen captures of an eagle capturing a seabird at Race Rocks which she had stored on her computer in England. Indeed she was in tune with webcams in various parts of the world and still sends comments on how the loons are doing at a nesting site in the US or how various eagle cams are reporting. It’s now been a full six years since her first captures of the eagles and peregrine falcons from the remote cam at Race Rocks. The photo galleries from November 2004 to October 2007 are archived at http://tinyurl.com/ 2adrsp and the monthly albums from 2008 to 2010 are archived in the main diary file on racerocks.com. camera well before most of us are up on this side of the world. Her sunrises are beautiful, and her storm images capture the spirit of the island so well. She also made the effort to remind us when a camera needed cleaning, and partly because of her we installed a daily automatic cleaning system for camera 5. After one storm, she pointed out the missing shingles on the winch house, another time it was the first breeding of the elephant seals on Middle rock. island . With the multiple pictures she often sends, we have also been able to make time lapse movies. The raw material provided by her monthly albums could now form the basis for an in depth analysis of a six-year record of the monthly bird and mammal occur- rences in the Ecological Reserve. We have been fortunate to have Pam and her husband Dennis visit us and we have been pleased to be able to provide them with a tour of Race Rocks several times in the last few years. Pam has indicated she will be ending her service to us as monthly photo image diary keeper at the end of this year, but I know she will still continue to send us those exceptional shots when she gets them. On reflection, I don’t know of any other Ecological Reserve in the province which has had such a regular and long-term image record of events made available by a volunteer, especially one from another continent! We owe a great deal of thanks to Pam for making her pictures available to us at her own cost. This is one example of “citizen science” which transcends borders but which is invaluable for the docu-mentation of events and creatures on our ecological reserves here in BC. Our hats off to Pam Birley for a volunteer’s job done so well. the home page of www.racerocks.com.